Adoric is a real-time customer engagement software designed to help businesses fully understand their customers by generating insights through behavioral reports. These insights are used to create and implement effective strategies to improve the users’ conversion rate and drive their business forward. With Adoric, users have a complete and clear understanding of what empowers their customers to perform the users’ desired actions, whether it’s purchasing a product, subscribing to a service, or sharing marketing materials to their circle of friends and loved one. Adoric has many applications that lead to better business growth and more revenue. Users can leverage Adoric in many ways, from creating bigger email lists to reducing cart abandonment to growing their leads to promoting their content and more. Adoric helps you compose the perfect marketing message for specific audiences. With its powerful reporting tools, you are able to generate reports that help you identify and categorize your target audience based on their behavior, interactions, events, and history. You can set the software to send pop-ups containing messages that trigger your desired behavior, empowering them to respond to your CTAs and actually perform your desired actions. Not only that, Adoric determines when is the best time to initiate contact with your target audience. From the moment they try to exit your website, leave their carts, or when they just arrive, the software automatically analyzes and learns user behavior and identifies the most opportune time to engage, ensuring user response and attention. Adoric comes with a user-friendly Drag-and-Drop editor that lets you create amazing, professionally crafted pop-ups painlessly. If you want to incorporate your own themes, graphics, and other visual elements, Adoric’s editor makes it very easy. This results in pop-ups that catch your target audience’s attention and encourage them to take action. 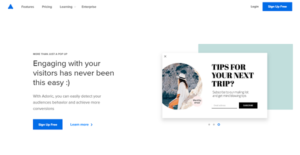 Prior to sending pop-ups to your target subscribers and users, Adoric lets you test their effectiveness to ensure engagement and positive response from your audience. You can test multiple variations and parameters using A/B and A/A tests and base your improvements on data-powered insights. What Problems Will Adoric Solve? 1) Abandoning, bounce rate, dwell time and much more names to describe situations that users leave a website, can be reduced dramatically. By testing different offers like sales, unique content, subscription on many people, you can actually learn how to make people change their mind in the last second, stay on our website and even convert. Exit intent popups can have quite a lot of science behind them. With Adoric, you can achieve the best exit-intent popups with ease. 2) Some companies actually maintain a website not as the main sales channel but as an informative channel. By segmenting audiences, analyzing their behavior, constantly testing and improving popup elements, and making sure that the UI/UX is not disrupted – The creation of accurate user journeys becomes pretty easy. When done correctly, popups can help in increasing revenue per user with popups. It is a matter of applying the right principles and keep testing for the most profitable variables. For personalization, Adoric provides its users an interface to easily apply: event, user behavior, geo-location, history, cookies, and much more. For great designs, Adoric provides tons of templates created by professional designers, a drag & drop editor which allows absolute freedom in design, and a huge collection of hand-picked graphic elements. Putting these features together in testing allows Adoric users to skyrocket their value per user / potential user. If you are interested in Adoric it may also be a good idea to check out other subcategories of Best Conversion Rate Optimization Software gathered in our database of B2B software reviews. Each company has its own characteristics, and might call for a special Conversion Rate Optimization Software solution that will be fit for their company size, type of customers and employees and even particular industry they deal with. It's not wise to count on getting an ideal app that is going to be suitable for each business no matter what their history is. It may be a good idea to read a few Adoric reviews first and even then you should remember what the service is supposed to do for your business and your staff. Do you require a simple and straightforward service with only basic features? Will you really make use of the complex functionalities required by experts and large enterprises? Are there any specific features that are especially practical for the industry you work in? If you ask yourself these questions it will be much easier to get a solid app that will fit your budget. How Much Does Adoric Cost? We realize that when you make a decision to buy Conversion Rate Optimization Software it’s important not only to see how experts evaluate it in their reviews, but also to find out if the real people and companies that buy it are actually satisfied with the product. That’s why we’ve created our behavior-based Customer Satisfaction Algorithm™ that gathers customer reviews, comments and Adoric reviews across a wide range of social media sites. The data is then presented in an easy to digest form showing how many people had positive and negative experience with Adoric. With that information at hand you should be equipped to make an informed buying decision that you won’t regret. This tool have boosted my marketing so well. What are Adoric pricing details? What integrations are available for Adoric? If you need more information about Adoric or you simply have a question let us know what you need and we’ll forward your request directly to the vendor.